Luminous Bodies programmed art residency includes shared art studios, individual and group critiques, city gallery visit, guest artist talk, and a closing exhibition (or open studio if preferred). Artists are responsible for their transportation, food and art supplies, including projectors and speakers. Artscape Gibraltar Point (AGP) offers rich potential for the creation of corporeal artworks amongst its blue-flag beaches (Hanlans Beach being clothing optional) and natural surroundings of Lake Ontario, forests and gardens filled with flowers, fruit and vegetables. On the island, there are tiny quaint homes, a hobby farm and antique carnival grounds. The Toronto city core is just a 15-minute ferry ride away. You can read more about Artscape Gibraltar Point here. For a greater sense of the island itself and it’s community, check out Friends of Toronto Islands or Toronto Island Community. Facilities include a large communal kitchen, artist studios with high ceilings and tall windows, extra-large common rooms, photo darkroom (chemicals not supplied), woodshop, small library, onsite coin-operated laundry (detergent included), and free wi-fi. Bicycles can be rented from the local bicycle smith. The communal kitchen is stocked with cooking utensils, some spices, and a limited supply of tea and coffee. Artists are given storage spaces for their (dry, refrigerated and frozen) foods in the communal kitchen where they cook their own meals. There is a pantry with non-perishable foods that artists leave behind. Artists are welcome to take from the pantry. More details about facilities are available here. There is no grocery store on the island, but there is a Kitchen Table (a corner store that is a bit pricey) across from the ferry dock. Or slightly further west there is Sobeys, a larger grocery store. It is suggested to bring a few food essentials to start and complete the bulk of grocery shopping once settled in. Other grocery stores include Essence of Life (organic and health foods), St. Lawrence Market (farmers markets), and Loblaws (large grocery store chain). There are some restaurants on the island, including Rectory Café (Wards Island) and Island Café (Centre Island). Each is about a 45 minute walk, or 15 minute cycle, from the art centre. Some art stores in the city core include Currys, Above Ground and Gwartzmans. Photography stores include Henry’s and Downtown Camera. Active Surplus offers a variety of odds and ends, including plexi-glass, mirrors, electronics, small plastic and metal parts, etc. Advance shipping of art supplies or packages can be sent through Canada Post’s FlexDelivery, to your choice post office in Toronto. Accessibility: AGP is a barrier free and inclusive environment. The ferry docks, ferry boats, and island roads are wheel chair accessible. There is a boardwalk ramp that leads into the beginning section of sand of Hanlans beach. We are looking forward to your visit at Artscape Gibraltar Point! So we can welcome you, please RSVP to info@LuminousBodies.com. The best way to get around the island is by bicycle, but it is also walkable. Click here for Map to Artscape Gibraltar Point. From Pearson International Airport: There is the Union-Pearson Express train that takes you to Union Station. From Union Station take the #509 or #510 streetcar to the Jack Layton Ferry Terminal. Alternately (more economical), from Pearson International Airport take the #192 Airport Rocket to Kipling Subway Station. Then take the subway system to Union Station and from there board the #509 or #510 streetcar to the Jack Layton Ferry Terminal. From Billy Bishop Airport: Walk north to the corner of Queens Quay and Bathurst St., and board the #509 Harbourfront streetcar eastbound. Get off at Bay St., which is at the ferry dock. From Union Station: take the 509 or 510 streetcar for one stop to Queens Quay Station, which will land you across the street from the ferry dock. From Toronto Coach Terminal: take the #6 Bay bus southbound to the ferry terminal. Jack Layton Ferry Terminal: Located at Bay Street and Queen’s Quay West (10 min walk from Union Station). Public transit to the ferry docks includes the #509 or #510 streetcars. For information on connecting routes, contact TTC at 416-393-4636 or visit TTC Trip Planner. If you are driving, there is public parking available 1 block north at Lakeshore and Bay, 1 block west on Queens Quay between Bay and York, and 1 block east opposite Toronto Star building. Ferry Service: The two 15-minute ferries that get you closest to Artscape Gibraltar Point are Centre Island and Hanlans. However, only Wards is available during the fall/winter season. Once you are on the island, it will take apx. 25 minutes to walk to Artscape Gibraltar Point. Cycling is faster, and bicycles can be taken on the ferry. The fare for the ferry is approximately $8 return for adults. Expect large crowds on hot sunny days and weekends. To by-pass the long ticket lines, there is a ticket booth under the concrete canopy (on the right), which is not so busy. Click here for the ferry schedules. For more information on the ferries, call 416-392-8193. Water Taxi: From April to October, water taxis leave apx. every 10 minutes from the foot of Spadina or York streets, and cost $10 per person. You can also call a water taxi (more costly if few passengers) at 416-203-8294 (York St.) or 647-347-8454 (Spadina St.). Custom drop offs, such as to Artscape Gibraltar Point lighthouse (right at Artscape Gibraltar Point), will be more expensive. Tender Boat: A tender boat costing $8 each ride (capacity for 22 people), leaves York Street to Toronto Island Marina at the following times. The marina is a 20-minute walk to Artscape Gibraltar Point. 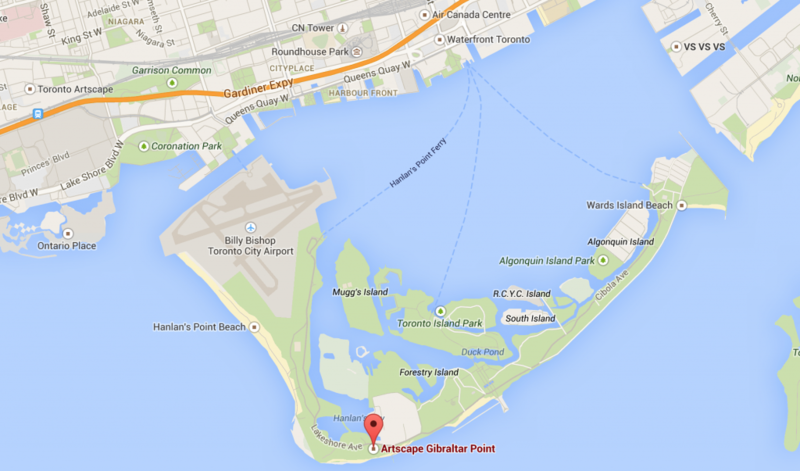 AGP: AGP (Artscape Gibraltar Point) is located at 443 Lakeshore Avenue, Toronto Island. We are approximately a 25-minute walk from the Centre Island or Hanlans dock. The signs along the pathways that will guide you here. The most convenient way to travel on and off the island is by bicycle. If you do not have a bicycle of your own, you can rent one through Manuel Cappel, an islander and AGP long term tenant. Text him at 416.804.0571 or email at mandrasca@gmail.com.